What drives a person to drink so much to be considered an alcoholic? Are they drowning their sorrows? Do they wish to forget their past and escape the present? Do they feel pain and can only lose themselves in alcohol? What actually causes someone to be an alcoholic? There could be many complicated reasons why people drink. But if you could get to the root of the problem, it could be a massive breakthrough. It could unlock the key to your rehabilitation and show you how to live without alcohol. Alcoholism can be a long-standing, debilitating illness which affects both the body and the mind. In most cases, alcohol addiction may not have one primary cause, but there were many contributing factors which could lead someone to physical and psychiatric dependency. It is often said genetics, environment, life experience and disorders such as stress and depression, among other considerations can play a vital role in someone developing a drinking problem. Some have felt alcohol addiction may be hereditary, but no actual alcoholism gene has been identified, although your upbringing may influence whether you grow up to drink yourself. You might have far more chance of being an alcoholic if you had a parent who drank. It is widely believed alcoholism may run in families and some people may be genetically predisposed to drink, especially if they grew up with alcoholic parents. Many claim to have an addictive personality which makes them prone to drink. It is also not unknown for some people to give in to peer pressure from possibly friends or family members who may be unwittingly encouraging them to drink. There are cases of people dealing with an unexpected life event, such as suffering a trauma or a bereavement which could cause them to start drinking heavily. If you have suddenly become unemployed or have gone through a breakup, you may turn to alcohol to cope. It is also common for people afflicted with a psychiatric disorder to consume alcohol as a form of self-medication. Mental health issues play a prominent role in alcohol addiction. There are instances of individuals suffering from numerous conditions, from stress, anxiety, and depression, to post-traumatic stress disorder or bipolar, falling prey to alcoholism. 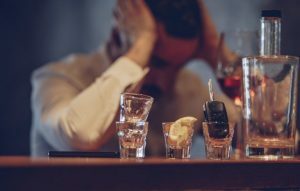 They may be drinking to try and curtail their symptoms, as it is believed people who have psychological disorders are more likely to turn to alcohol, but it is only a temporary solution. However, you think it has the desired effect, making you forget your worries, and you want to repeat the feeling. So, you keep on drinking, possibly on a weekly or daily basis until it becomes a habit. Alcohol is used as a coping mechanism, you think it will make you feel better, but it only makes things worse. This is because alcohol is a depressant and affects the chemicals in the brain, possibly altering your mood and making you susceptible to addiction. But if you are grief-stricken, lost or depressed, or if it is down to your personal history, you may feel alcohol is truly your escape. You think it is the only thing that can get you through life, which is how so many people develop a drinking problem. These are the triggers which may set you on the road to dependency and cause you to become an alcoholic.